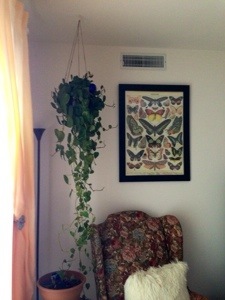 So I’ve had this plant for about four years now which for me is an eternity! I definitely do not have a green thumb, most of my plants die right away, but this little guy has been able to survive me so far. I kept it in the plastic basket it came in because I was too scared to re-pot it but hated the way it looked in my house. I figured a simple fix would be to take the plastic hanger off, drill four holes evenly spaced around the top of the rim and string twine though to hang, and it made such an improvement with very little cost and no replanting, yay!